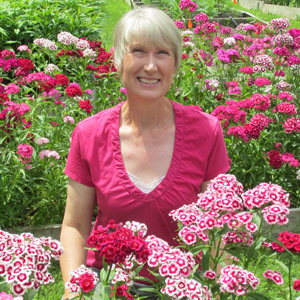 Linda VanAppledoorn is the owner of Take Your Pick Flower Farm and loves sharing her passion for flowers with others! She started her business in 2006 and has since expanded it to be one of the top U-Pick flower farms in the country. Her services now cover a weekly summer Flower CSA (subscription service), DIY and full-service event and wedding flowers and classes in flower arranging. She knows there can be many challenges to gardening – including pesky woodchucks and deer. But she wouldn’t trade it for anything else!